“We are proud to continue our relationship with the Frontier League and become the Exclusive Winter League of the Frontier League. We believe this agreement will help players make the best decision about the path that they want to take in professional baseball,” said CWL President Andrew Starke. “The goal of this agreement is to strengthen the relationship between two first class leagues, the Frontier League and the California Winter League. Hopefully this agreement will help players make an easier decision when deciding how they want to go about pursuing professional baseball,” added CWL General Manager Justin Reschke. The agreement strengthens the path that already exists from the CWL to the Frontier League by encouraging players to attend either the CWL or the Frontier League tryout and Draft. Players from the CWL as well as players from the Frontier League Tryout and Draft have a higher likelihood of sticking with a Frontier League team for the duration of the season than players coming in from other leagues or taking other avenues to the Frontier League. “The Frontier League sends more players to MLB affiliated baseball than any other independent league year after year. This is due to the reputation that the Frontier League has built over 25 seasons as a league that features high level competition, top notch facilities, reputable coaches, and passionate front office staff and ownership. This agreement with the California Winter League keeps us working with a league that is at the top of their industry in the CWL,” said Frontier League Deputy Commissioner Steve Tahsler, who attends the CWL each year for the duration of the league. 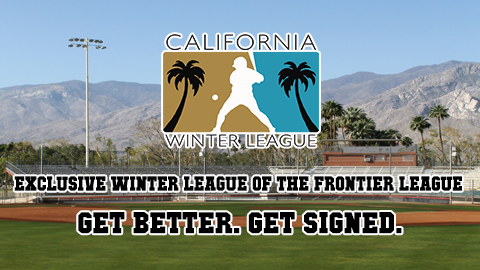 “The Frontier League is pleased and proud to extend our agreement with the California Winter League. Our previous relationship with the CWL has demonstrated that they perform in a first class manner. We feel they best reflect our values and attitudes towards players and operations,” added Frontier League Commissioner Bill Lee. The California Winter League will open its 10th season on January 21st, 2019 which will conclude on February 18th. Over the past 9 season, the CWL has seen over 650 of its players receive professional contracts to begin or continue their baseball careers. Entering its 26th season, the Frontier League has seen 34 former players go on to make their Major League debuts in Major League Baseball. At the conclusion of the 2017 season, the Frontier League had 81 former players on rosters with MLB affiliated clubs, including 3 players at the Major League level. The Frontier League season begins on May 10th.